On a summer night in 2007, the Azure Party, part of Sydney's annual gay and lesbian Mardi Gras, is underway. Alongside the party outfits, drugs, lights, and DJs is a volunteer care team trained to deal with the drug-related emergencies that occasionally occur. But when police appear at the gates with drug-detecting dogs, mild panic ensues. Some patrons down all their drugs, heightening their risk of overdose. Others try their luck at the gates. After twenty-six attendees are arrested with small quantities of illicit substances, the party is shut down and the remaining partygoers disperse into the city streets. For Kane Race, the Azure Party drug search is emblematic of a broader technology of power that converges on embodiment, consumption, and pleasure in the name of health. In Pleasure Consuming Medicine, he illuminates the symbolic role that the illicit drug user fulfills for the neoliberal state. As he demonstrates, the state's performance of moral sovereignty around substances designated "illicit" bears little relation to the actual dangers of drug consumption; in fact, it exacerbates those dangers. Race does not suggest that drug use is risk-free, good, or bad, but rather that the regulation of drugs has become a site where ideological lessons about the propriety of consumption are propounded. He argues that official discourses about drug use conjure a space where the neoliberal state can be seen to be policing the "excesses" of the amoral market. He explores this normative investment in drug regimes and some "counterpublic health" measures that have emerged in response. These measures, which Race finds in certain pragmatic gay men's health and HIV prevention practices, are not cloaked in moralistic language, and they do not cast health as antithetical to pleasure. "Pleasure Consuming Medicine is one of the best examples of critical cultural studies I have read. The scholarship is truly stunning. Kane Race presents a highly original argument which extends thinking about several interconnected issues: HIV, drugs, drug culture, embodiment, medical governance, sexuality, and identities." 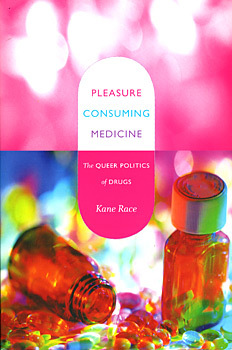 "Kane Race's Pleasure Consuming Medicine supplies what we have missed for so long: a radical but responsible exploration of both the ethics and the politics of pleasure. Exhilarating in its daring and its intelligence, startling in its originality yet completely sensible in its interpretations, the book unerringly describes the paradoxical world where we now live out the cruelties and ecstasies of human embodiment." -- David M. Halperin, author of Saint Foucault and What Do Gay Men Want?